I'm sure you know that the new iPad has a new and higher res screen, but did you ever wonder what that meant on a microscopic level? One UI did, and he's posted a bunch of photos taken with his microscope. I know I've said that I'm not interested in getting one, but the technical details are fascinating stuff. I had always assumed that pixels are square, but clearly that's not the case. The following gallery includes both iPad screens, the Kindle Fire, HP Touchpad, and the BB Playbook. There's no shot of the Nook Color or Nook Tablet, unfortunately. The amusing thing about the iPad3 is that the only remarkable thing about the unit is the display which is apparently a Samsung unit. Which is rather amusing given that Apple keeps treating Samsung like the Great Satan. I would be very interested in a Samsung tablet combining a similar display with their neat Wacom pressure sensitive stylus tech. The rumored 11.6″ Galaxy Tab is suppose to have a screen resolution of 2650 x 1600 that if true would give it about the same pixel density as the new iPad. Key thing is providing the required performance for running the HD screen and still keeping the power consumption low enough to not cause any change in potential usage. The new iPad for example had to increase the battery capacity by about 70% from 25WHr to 42WHr. However, they didn’t change the charger so it takes about twice as long to charge… up to 7 hours when off and up to 18 hours while in use. 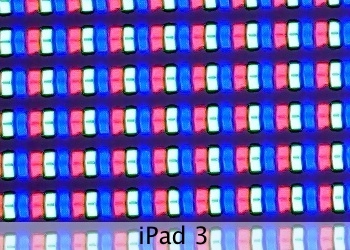 Ipad2 and HP TouchPad look like the same screen (rotate one of them 180 degrees – same pattern).